With the economy picking up and employment rates gradually rising since the 2008 crash, more Millennials (those born between the early 1980s and early 2000s) are finally gaining financial traction. For many, this means they’re now in a position to find a place of their own. Since the crash was so hard on many Millennials, some may be nervous about making the investment of buying a home. But the good news is buying a home is often a smarter (and safer) investment than renting. 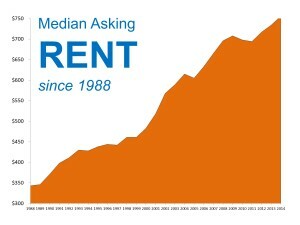 The cost of renting can go up dramatically over the years. 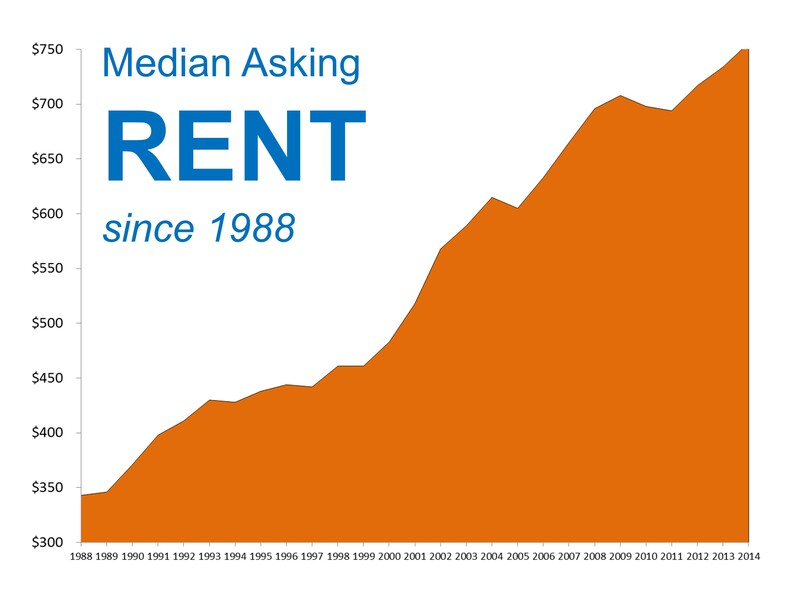 According to the diagram at the right, the median cost of rent has more than doubled since 1988, and it looks like it’s going to keep rising. Renters are at the mercy of the ever-rising market. But with a mortgage, you lock your price in for the next 30 years no matter what the trend. So if you’d gotten a mortgage in 1988 at the then-normal rate of $350, you’d still be paying $350 now while your renting friends are paying $750. Not bad. True, home ownership does include occasional costs that renters don’t have to worry about—such as repairs—but even with that, you still come out ahead financially. Becoming an adult brings with it all sorts of fun new experiences–and then there’s taxes. Also, if you own your home for at least two years, then sell it and make a capital gain, you don’t have to pay taxes on that gain like you would other income. This benefit caps at $250k for single homeowners and $500k for married couples. 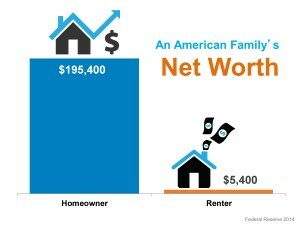 Owning a home dramatically increases your net worth. The average net worth of an American family that rents their home is $5,400, while the average net worth of a family that owns their home is $195,000. That’s 36 times more! Your higher equity can open financial doors in the future—you can use it to your advantage if you need a loan to start a business or make another significant investment. You have to pay for housing one way or another. The main difference between buying vs. renting is who benefits from those payments. When you own your home, you are putting the money each month into something that you actually own. You can sell it if needed and recover what you’ve put into it. Your personal equity increases each year as you pay off more of your mortgage (and then even more as your home’s value appreciates). When you rent, you are doing the same thing—only it’s for your landlord. You’re helping him pay off his mortgage and increasing the value of the property, but at the end of all those payments, you have nothing to show for it. If you’re finally ready to get a place of your own, don’t discount the long-term financial benefits of buying instead of renting. And if you think you’re ready to buy but aren’t sure where to start, give us a call. We’ll walk you through all the steps and help you find the perfect home to start the next phase of your financial future.